The presentation ofThe Great Contemporary Bow Makers of the 21st Century Volume One at the Mondomusica 2011 caused some global publicity, which even earned Darling Publications the honourable (?) description of “Cologne-based boutique publisher” by the American Strings magazine. It took several months for master bookbinder Erwin Hendricks to finish the 15 books for all participating bow makers of Vol. One. 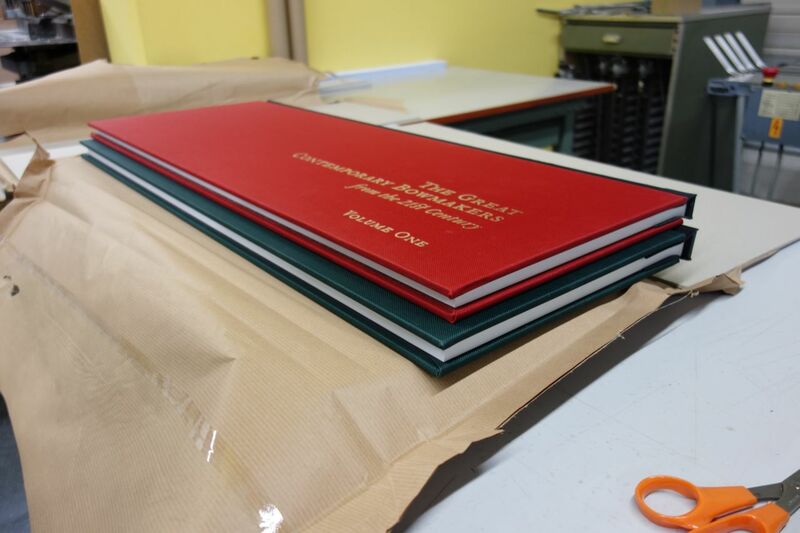 My personal copy (bound in the vibrant red fabric like every single one of the 100 copies) with dedications to me from almost all bow makers in the book was suddenly unfindable and already thought to be lost. But it did finally show up in Crozon (Britanny, France) at Eric Grandchamp´s home as he was wondering why all the friendly wishes and dedications of the esteemed colleagues, including his one, were not adressed to him, but to me. After its safe return to the bookbinder, it carries now a dark blue cover to be better distinguishable from the red ones. A plethora of rumors and inquiries could be read on the world wide web about this Opus Magnus (Vol. One), from tracing its origin and unknown people explainingg the manufacturing country to be Spain (?) to multiple copies orders from the Far East. Thankfully everybody had the understanding of waiting several months for their copy, as they all had to be stitched by hand; probably that seemed quite short in comparison with the story of my own 7 year waiting time for the finally successful presentation of Vol. One in Cremona. For Vol.Two most makers made use of the now very familiar triangular tubes from FedEx and UPS, but some makers from USA, Finland, France and Italy came personally with boxes with their bows to Cologne, bottles of red wine and other alcoholic beverages for some serious scanning sessions, the frequency of visits increased till short before the deadline. Sometimes collegues, even understanding wifes generously took the role of bow courier. Pre-booked flights and train departures caused several nights with shortage of sleep, the egg timer proved his value guaranteeing 55-minute sleeping intervals – similar as the scanning cycle of a single bow (59 minutes). With many makers I shared intensive talks, several wine bottles followed by some exceptional eau de vie´s, which would not had taken place without this challenging project. Always in the seemingly eternal cycle of 59 minutes of a bow scan with its interval of cleaning, measuring and positioning the next bow. When I started this project (mentally in 2004, developing technically the equipment in 2005, announcing in 2006 and finally presenting Vol. One in 2011), I did not know even the names of several from the younger makers, presented today already in Vol. Two. To wittness their development from bow to bow was amazing, from learning from masters in the Vol. One to receiving their first Certificates of Merit and Gold Medals. If the speed of making this kind of documentation in my dearly beloved medium of the printed book stays the same slow as now, we soon can see third generation bow makers! As the senior of this book we can welcome Risto Vainio from Finland, whose first bow of 1957 can be considered as a early milestone. Especially by showing courageously his very first bow he deserves our great respect, even more for what he reached in the following years with a lot of enthousiasm and diligence. His most recent bow, which turned out to also the last bow on the last page of this Vol. Two, was this year´s Micro Photo lens bow (2013), which he made at the age of 83! The presented Vol. Two of The Great Contemporary Bow Makers of the 21st Century here can, if we consider the Vol. One with 15 bow makers to be the Opus Magnus, indeed be described as the Opus Maximus, as it presents 20 bow makers, most with approximately each 19 bows – which makes this publication a dream for all discriminating connoisseurs of the Art of Contemporary Bow Making, showing almost 400 modern bows by 20 makers (and some sort of a nightmare for those involved with the retouching and lithographing). After Sylvain Bigot was the very last one to ship his Micro Photo lens bow for Vol. One, the honour of being the very last maker shipping the Micro Photo lens bow to Cologne to be scanned for Vol. Two, goes this time to … Dirk Löscher from Barcelona! Dirk, after heavily begging for more time, finally got a week-end more time to get a even more better finish of the polishing, decided instead to use that luxurious extra time to remove the finished head plate to replace it with a more creative ivory-ebony-ivory sandwich headplate, which turned out to be the only one of that kind of the entire book. (Bernd Etzler from Budapest shows a head plate with an opposite mixture; ebony outside, ivory inside). Some new experiences for me and some bow makers occurred in most unexpected ways. Ole Kanestrom received a shipping of two bows back from Germany to Port Townsend after weeks of delay in a seldom state to be seen; the polish melted, glue was protruding from under the silver backplate of Ole´s Micro Photo lens bow, the thumb leather brittle like cardboard; something he had never seen before. The stick of a customer´s bow warped. We suspect that maybe the opend tube at the US customs showing wood products caused a stay in a kiln dryer or microwave energy dryer. The presentation of the Vol. One at several occasions did lead to frequent enquiries about the selling price, which did seem for some to be a mentally insurmountable obstacle. The comforting words that indeed nobody but a very few does need such a work, and that after seeing it once, at least dreaming about it was entirely for free, surprisingly made some to re-think the general attitude towards the needs of life; arousing the desire to be in the company of the very few and commit themselves to confirmed and prepaid orders! On the other side, on some occasion I was told that the price was actually too cheap, which I humbly agreed on. The fact that it was meant seriously could be recognised in the order of 3 copies at once! Another enthousiast bow maker stated that he saw the publication as an amazing source of knowledge and that the equivalent of learning was many times more than the bare purchase of a book. Like with all other art publications I experienced exactly the same: some people I never expected from, immediately purchased a book, others from whom I expected to be interested and capable to afford it, actually never showed interest. My utmost thanks and especially respect goes to all those who supported me not only financially by purchasing Vol. One, but a lot more important was the encouraging effect it had on me to go on with this project. The second group of Micro Photo lens bows by the here presented 20 makers varies from classical Vuillaume style to complete new bow design, not to forget the unexpected creativity, pushing with great craftmanship technical, mechanical, optical and esthetical boundaries, surely the first 15 lens bows of Vol. One was inspiring for some and challenging to the other. A big compliment was to see respected bow makers and experts from Paris presenting in December 2012 posters with full size classical bows with their cambers. In contrary to some opinions which saw my initial ideas of 2004 as intellectual property being copied, I need to express my happiness that my ideas were obviously interesting enough to also give it a try, or maybe even to improve. Waiting impatiently to see more attempts, realistically expecting improvements to be reached, but hopefully not too soon! Today, nearing the end of the year 2013, the digital technology already makes the equipment used for Vol. One and Two from 2005 look like a piece of prehistoric technology; todays state of the art equipment do the same in better quality and in only 7 instead of 59 minutes! Bye the way, unfortunately the price tag shows the triple price. But without “The Discovery of Slowness” of the 59 minute scan per bow I would not have so many conversations with great makers and personalities, which gave me the opportunity to get to know several makers closer, not only by their great bows, but also in a lot of different facets of their mind. These shared moments I never would want to have missed. To the same team of Marco Lietz, Jörg Asmuth and Erwin Hendricks I feel obliged with uncountable thanks. I wish the reader a great time with the following 393 bows of The Great Contemporary Bow Makers of the 21st Century – Volume Two ! So, after further discussion, I chose instead to make a silver mounted bow, a second frog and button set available in gold which used the very last of my scrap. This is also a nod to the long standing tradition of having a reserve frog and button made for a special bow,. So when viewers find the only silver mounted lens bow in this book, they will know a little more about why it is here. impreziosita dalla scelta dei materiali e dalla qualità delle immagini, riesce ad esaltare la perizia artigianale e artistica propria della realizzazione di ogni singolo arco e la materia esprime se stessa con il coraggio della realtà oggettiva. Cinque anni orsono, mi hai presentato i contorni di un’idea affascinante, frutto di una geniale intuizione, che poi si è mostrata per tutta la sua intensità: avrei dovuto ripercorrere la mia carriera attraverso l’individuazione di un numero definito di creazioni. Ecco che, seduto al tavolo di lavoro del mio laboratorio di Cremona, ho iniziato a viaggiare mentalmente per rintracciare, con il filo della memoria, singoli archi a cui ho nuovamente legato ricordi di avvenimenti particolari. Ho scoperto che successi professionali, delusioni ed episodi familiari hanno conservato la loro espressività nel corpo ligneo dell’arco. Non so più dire se sia l’arco vincolato all’aneddoto o viceversa, ma ho potuto constatare che la storia dei miei lavori coincide con il mio vissuto personale: la tua proposta mi ha dato la possibilità di individuare diciannove capitoli di una mia ipotetica biografia, realizzata attraverso le immagini. Proprio come l’arco dà voce allo strumento, le tue fotografie scandiscono la partitura di trent’anni di esperienze professionali e umane, che suonano armoniose nel tuo volume.